1. As my machine has no GPU hardware, I am going to install Caffe without CUDA support. 2. 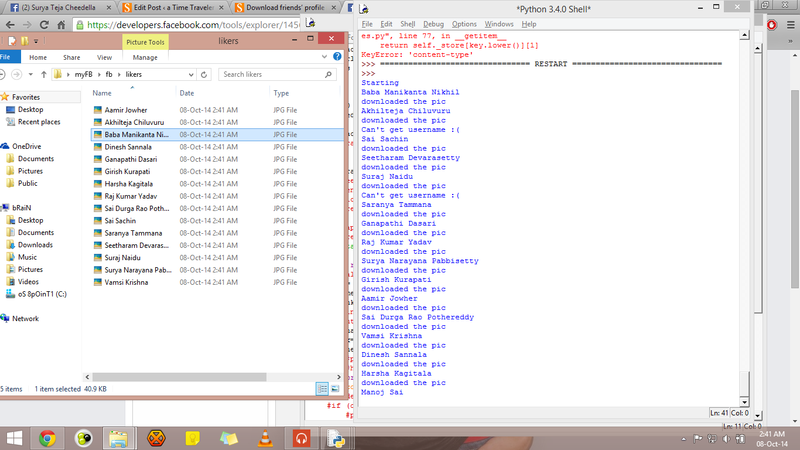 I am going to install only Python wrapper for Caffe. As the installation page on Caffe has no detailed instructions to install all the dependencies required and get your system ready to run CNNs , I am writing this small tutorial to set Caffe Up and Running on your machine. It is advised to use Anaconda Python distribution as it installs most of the requirements for python wrapper around Caffe (though it install a lot of packages we have no use). But, installing Anaconda is up to you. Download Anaconda and run shell script. Add the path of bin to #PATH in file ~/.bashrc. Get gflags and install on your system. Download google-glog and install. You can also install through apt-get. And install snappy. Get leveldb onto your machine and lmdb with its dependencies. Download Atlas and Lapack (directly downloads when you click on link!). But before installing, you need to modify your CPU frequency/scaling. You you get errors saving the file, try to use different editor. I have tried sublime, gedit. Finally with I can modify with emacs. Change the scaling for all of your CPU cores to replace the single word in the file with ‘performance’. Install dependencies for python wrapper if you didn’t choose to install Anaconda Python distrubution. The dependencies file is in caffe/python. And install hdf5 via apt-get. Download latest 3.0.0-beta version (file automatically downloads if you click) of OpenCV and build it. But before install all the dependencies of OpenCV. Now, we are almost done with getting all the dependencies of Caffe. So, lets dive into getting Caffe up and running on our machines. Modify the makefile as your needs as shown in installation page. If you have errors while installing even followed this tutorial, you can search for any known issues on their issues page. One of the errors I faced is this. And I am able to solve it as suggested in the comments section of issue page. At last, now, you have Caffe installed and running on your machine. Download friends’ profile pictures on facebook! Hello guys, before going into the topic, I wanna say you one thing. This method may not fetch all of your facebook friends’ profile pictures. But, this is the efficient way*(considering the number of pictures you get) you can find on whole internet(exaggerating 😛 ). *depends on your popularity on FB. Considerable knowledge of facebook GraphAPI. Nice video explaining GraphAPI. 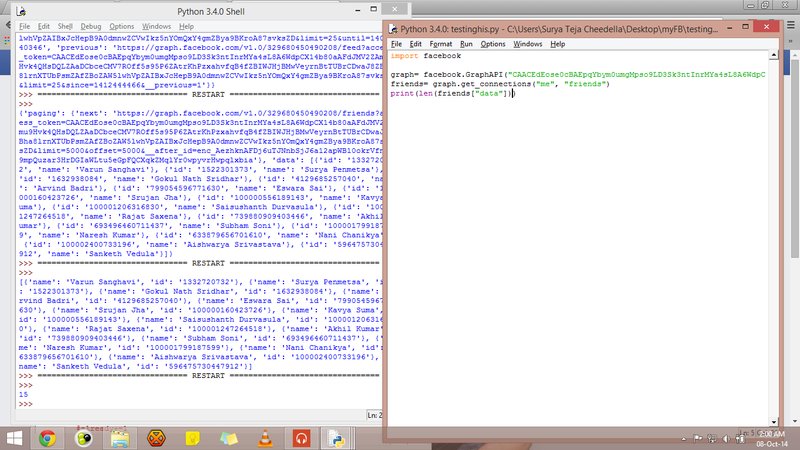 Installed third-party facebook-sdk for python. As I am going to use python. So, with a simple google search for getting friends’ pics, you might land on a hell lot of pages with most of them using a call to friends (/friends) with a user node(me/friends). Okay. So, why isn’t it efficient? Here’s the catch. The permissions required to make this call from this page. The ‘second point’ states it will only return those who have use the app making the request. I don’t know what’s your case, but, for me it returned only 14 friends of 970 in my list. Very disappointing. Try it for yourself and let me know how many nodes( 😛 ) it returned in comments. It returned only 15 friends in my list. I think our aim is to fetch profile pics, not getting friends list! You can see that for yourself. It returned some other value in the place of user id. So, now, some how, find a way to get user-id of our friends. Likes! Yes the answer is likes. You can get your friends’ user-ids (depends on their settings. But, you can access 90% of them.) by passing any of our pics or statuses with most number of likes. Find its id in search bar by clicking on your pic. Now, you can pass <pic-id>/likes which returns a list of friends who liked your pic. Now, here’s the brilliant part. FB provides a link to their profile who all liked your nodes(pics or statuses). #returns only 1000 friends maximum. In this process you may get some errors fetching friends’ username, because of their settings. In that case we check for it and try to ignore those links. #'https://www.facebook.com/profile.php?id=100005090622885&amp;#8242' It looks similar to this. From which we can’t extract username. If you are planning to download pictures of friends who liked your nodes from two or more nodes, you may get repeated users i.e. one of your friends may liked both of your nodes. In that case we try not to re-download their pictures. OMG! omg! I got a lot of pics. So, now what to do? You can do a lot of things. Really a lot of things. You can build a crazy face-recogniser like this one here. For entire code you can visit my GitHub page. Hello folks, How’s it going! Today I am going to introduce my face detection algorithm. (not a big one though) Don’t think that this is really a huge task! I am not working from scratch (means I am not actually gathering a huge data set of all pictures (both negative and positive, i.e having faces and not ) and train my algorithm). I have used haar Cascading files. What the heck are they? Here we go. Coming to the juicy part, the code, here it is. I have commented briefly what each line is contributing. #import the xml files. here i am using frontal face and eye. #this only takes a image and shows the faces in the image. It dont modifies the image. 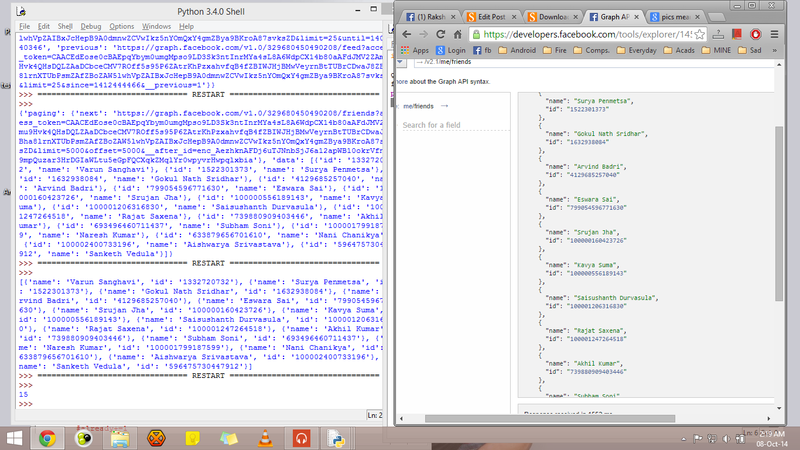 Currently, I am working on alphabet detection thing to won in a bet with my friend. and then there, it thanked all my friends who wished me on my timeline. It’s afternoon on 4th and as usually I am browsing on quora and facebook. I stumbled upon ‘what are the best python codes you have written’ question on quora. I saw some top answers which are actually thanking friends on FB on their birthday. Actually it’s the best time to learn or just copy&paste all of that code so, I can make my thanking task easy for tomorrow. But, I wrote ‘Hello world’ program in python just two weeks back. And completed reading like 100 pages of ‘Head first python’. So, I started searching on web and got to know about some thing called GraphAPI. After spending like 5 to 6 hours, I wrote that 10 lines of code (in a perfectly working condition) and tested it. You can say, dude why don’t you use that already written code found on quora. Basically all those codes are old. I mean those are the codes written before releasing GraphAPI by facebook. With that thing for facebook developers, one can reduce their code to 10 lines (yeah, you look their) from 40 to 50 lines of code which I have found on Quora. That is not the best way to reach our goal (like commenting on last ‘x’ number of posts on my wall) but, that is what I can learn in that span of time.